Saved by the linesman. Twice within the first half was Kenny Miller onside and through on goal and twice did the linesman flag for offside. They were not marginal decisions and Leicester City were very lucky indeed to not concede before the break. Not that the Foxes did not have their opportunities. Andy King fired wide from eighteen yards after he was given time to bring the ball down outside the box, whilst Matt Mills had an opportunity from six yards that was saved by Cardiff keeper Lee Marshall. The clearest chance of the first half fell to Lee Peltier, whose header was stopped on the line by least-cute E.T. lookalike Robert Earnshaw. It's all very well playing like Arsenal... But the Gunners' results so far this season have been nothing to shout about. A final product is what was lacking from both sides today, as was an element of class and finesse. This fixture was hardly a great advertisement for Championship football. Another good performance that will affirm Peltier's position as first-choice left-back in the Leicester City squad. His links with an impressive Yuki Abe provided a positive outlet beyond the Foxes' oft-congested midfield and their hard work on the wing could have resulted in the away side going three-goals ahead within the first half hour alone, should better have been made of the chances they created. Indeed, Peltier himself could have given Leicester the lead within that time if his bullet header (from a surprisingly well-delivered Richie Wellens corner) had not been stopped by the knee of ol' buck-tooth Earnshaw. This was much more like the Mills that Reading fans would recognise. The £5 million man was equally happy to be found in either penalty area and it was indeed in Cardiff's that Mills grew most in confidence, reaching a number of headers and loose balls in and around the box. On another day he could have had his first goal in royal blue. His newly-assured presence at the back was indicative of a man growing in confidence with his new teammates. 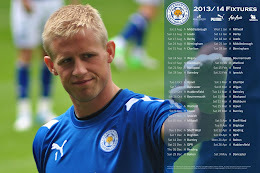 A good end to the game for Leicester followed the introduction of Manchester City loanee Michael Johnson. As has already been said by a number of commentators, when fit he could be the fulcrum around which the whole promotion campaign could pivot. Paul Konchesky's threatening, powerfully driven long-range shots were a standout feature of the Foxes' attacks in the early stages of the second half but as he moved into more and more attacking positions the full-back left his goalkeeper exposed, something Cardiff should have exploited much more effectively. Often caught in possession, Wellens failed to stamp his trademark controlling influence on this fixture and it was symptomatic of Wellens' failure to shine as an individual that Leicester City as a team did not spark the game into life. His niggly challenge for which he was rightly booked in injury time was typical of his day. The boy must have been wearing a sheep-scented body spray, for Cardiff's defenders were all over Jermaine Beckford this afternoon. The Foxes' striker caused hassle for the Bluebird's defenders with his pace and movement, allowing the likes of Yuki Abe and Andy King room around the eighteen yard box. As he faded in the second half, however, failing to grab his first Leicester goal, allowing Jeff Schlupp a chance to run at the Cardiff defence, with fresh legs, was no bad thing. Hi, of course this paragraph is really good and I have learned lot of things from it about blogging. What's up colleagues, good post and good arguments commented here, I am really enjoying by these. Spot on with this write-up, I seriously think this web site needs a great deal more attention. your submit is just spectacular and i can assume you are knowledgeable in this subject. Fastidious respond in return of this matter with real arguments and describing all about that. I'm gone to convey my little brother, that he should also go to see this webpage on regular basis to get updated from most up-to-date news update. personally suggest to my friends. I'm sure they will be benefited from this website. I'll bookmark your blog and take a look at again here regularly. I am moderately sure I will learn lots of new stuff proper here! Best of luck for the following! I'm very happy to discover this page. I want to to thank you for your time just for this wonderful read!! I definitely liked every bit of it and I have you book-marked to look at new stuff on your blog. on this page "Conclusions from the Cardiff City Stadium". visitors? :-P And, if you are writing on additional online social sites, I'd like to follow you. Would you make a list of all of all your social pages like your Facebook page, twitter feed, or linkedin profile? I've been browsing online more than three hours as of late, yet I by no means found any attention-grabbing article like yours. It is pretty value sufficient for me. In my view, if all web owners and bloggers made good content material as you probably did, the internet will be a lot more useful than ever before. don't have time to browse it all at the minute but I have bookmarked it and also added in your RSS feeds, so when I have time I will be back to read a great deal more, Please do keep up the fantastic job. I'm gone to tell my little brother, that he should also pay a quick visit this blog on regular basis to take updated from newest gossip. That is really fascinating, You're an overly professional blogger. I've joined your rss feed and look ahead to in the hunt for extra of your fantastic post. Hi! This post couldn't be written any better! Reading this post reminds me of my old room mate! He always kept talking about this. I will forward this page to him. Fairly certain he will have a good read. Thank you for sharing! Hello there! I could have sworn I've visited this blog before but after going through a few of the posts I realized it's new to me. Hey there! This post couldn't be written any better! Reading through this post reminds me of my good old room mate! He always kept chatting about this. I will forward this page to him. Pretty sure he will have a good read. Thanks for sharing! about this. I will forward this article to him. Fairly certain he'll have a good read. I appreciate you for sharing! about here? I'd really love to be a part of group where I can get suggestions from other knowledgeable people that share the same interest. If you have any recommendations, please let me know. Thank you! I'm taking a look forward on your next post, I'll attempt to get the grasp of it! Hi, i believe that i saw you visited my site thus i came to go back the desire? .I'm attempting to to find issues to enhance my web site!I suppose its adequate to make use of a few of your concepts!! lot for a fantastic post and a all round entertaining blog (I also love the theme/design), I don't have time to look over it all at the minute but I have saved it and also added your RSS feeds, so when I have time I will be back to read a lot more, Please do keep up the awesome job. now i'm following you. Look forward to exploring your web page again. Hi there it's me, I am also visiting this website daily, this site is in fact pleasant and the users are genuinely sharing nice thoughts. They're very convincing and will definitely work. Still, the posts are too short for novices. May just you please lengthen them a bit from next time? Thanks for the post. Thanks to my father who told me about this website, this webpage is really amazing. It's truly very complicated in this full of activity life to listen news on TV, therefore I only use web for that purpose, and obtain the most recent news. I've absolutely no expertise in computer programming however I was hoping to start my own blog in the near future. Anyhow, should you have any suggestions or tips for new blog owners please share. I know this is off topic but I just wanted to ask. Cheers! Hi! I've been reading your blog for a long time now and finally got the bravery to go ahead and give you a shout out from Lubbock Tx! Just wanted to mention keep up the excellent work! It's going to be ending of mine day, however before finish I am reading this great post to increase my know-how. acquired here, really like what you are stating and the way in which in which you say it.